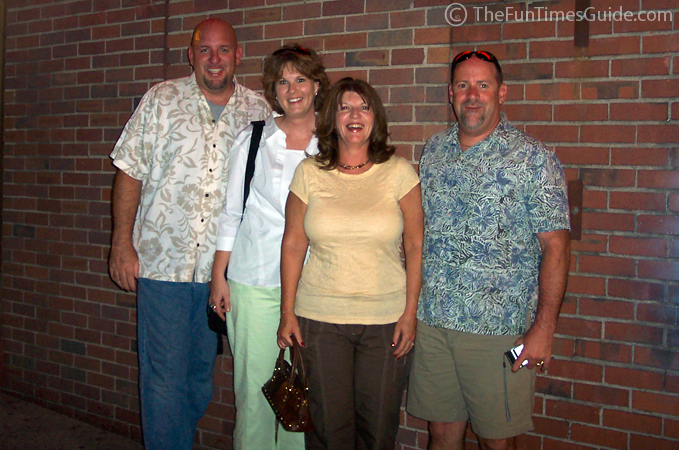 Here’s a funny little story about how TheFunTimesGuide.com led us (from Tennessee) to spend an evening with a really fun couple (from California). I love your site and all the great information. You and Jim sound a lot like my hubby and me. Hubby plays softball and we are Jeepers too! I am the writer in the family. We are coming to Nashville this summer to scout areas for relocation in two years and your site has really helped a lot. Thank you so much! We had exchanged a couple of emails — them asking questions about the area, and us encouraging them to move here. Beth also sent me a photo of them with their dog …which I posted in our dog site. Fast forward several months, and their trip to Nashville for the purpose of exploring places to live was this week. They flew in on Monday, then back out on Tuesday. We met them at their hotel near the airport. Jim is always excited to put on his best “this is your captain speaking” voice and drive visitors all over town — everywhere he thinks someone who’s never been to Nashville might enjoy. The entire way, he’s pointing out landmarks and trivial nonsense. 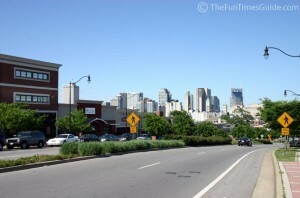 And all around the many side streets of downtown Nashville. (We spent a good deal of time looking for a parking spot — on the road — which is Jim’s personal preference). 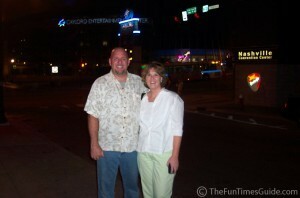 Our destination: Nashville’s honky tonks! We usually toss in a sidetrip to Alan Jackson’s house too, but we never made it to the south end of town this time. While the honky tonks aren’t exactly my thing, I must admit, that it’s kinda cool to think you’re in the same bars that many of the Country music legends got their start in. So, we did our own version of a Broadway pub crawl — where you enter through the front door of one bar, then exit out its back door. Enter through the back door of the next bar, then exit out its front door. And so on. The goal is to eventually get through all of the bars on Broadway. We got through about 6 or so on this night. Only one (of the half-dozen or so singers we saw this night) was worth writing about. 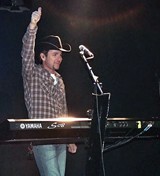 Craig Campbell was playing at The Second Fiddle on Broadway. We had never heard of him before, but we knew on first listen that he and his bandmates were much better than your typical bar band. His voice is strong …professional caliber. And his keyboard/piano skills are amazing as well. Plus, I realized one of the reasons I enjoyed watching Craig and his band play for so long was the fact that they all looked (and sounded) like they were truly having FUN! Often, the singers in places like this (where they only play for tips!) are struggling to connect with the audience. And you can tell they’re frustrated that they still have to play all these gigs to such small crowds. Crowds filled with people who usually aren’t even there to see them. The bar crowd is typically just a bunch of tourists passing through, and they probably won’t remember who it was they saw the night before anyway. But Craig Campbell was different. Beth and I both immediately wanted to know who he was. (By the way, why don’t they ever put a sign up in front of the stage so those of us who are enjoying the music inside will know who we’re listening to? There’s often a sign on the outside of the building, but never inside.) So Beth asked the bartender. I’m glad she did, too. Because Craig Campbell is one to watch! Check this out. So, after crawling in and out of a handful of pubs, we hit the road so I could get my beauty rest before getting up for work the next morning. Beth and Bruce are convinced that they’ll be moving here — sooner, rather than later. They’re looking forward to selling their overpriced condo in San Diego and buying a bigger, more reasonably-priced house here… on some land… at ONE-THIRD the price! I look forward to Beth and Bruce being “our friends with the boat” (…and the jet-skis… and the scuba gear!). Plus, they’re thinking about getting another Jeep Wrangler, too. Maybe by the time they get moved and settled in here in Nashville, we’ll have figured out what we’re going to do about building our new house. And maybe, just maybe, we’ll be able to use our Jeep to trailer our pontoon boat to the party! Don’t have a pontoon boat of your own? (We don’t either… yet!) Here’s where to rent pontoon boats in Nashville. Thinking about moving to the area? 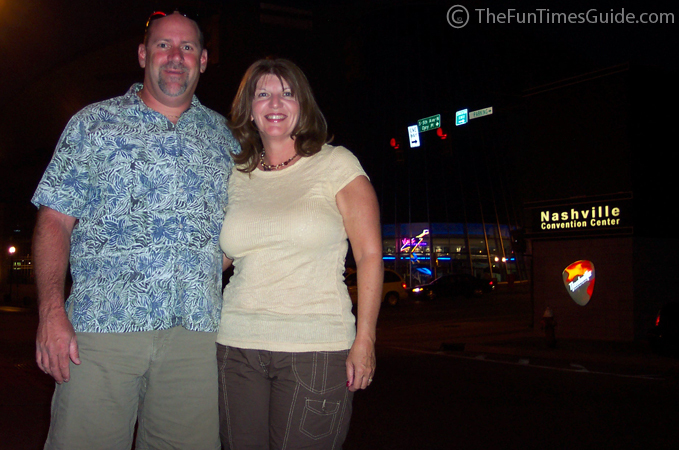 Just ask, and we’ll see if we can fit you in on our next trip: “Personal Tours of Nashville …hosted by The Fun Times Guide”. Jim… What do you say?